In the Nebrodi Charcuteries when you slice a Nebrodi Black Pig Salami you can appreciate its consistency adorned by a heady scent, and mainly by the right equilibrium between lean and fat. Further more when you taste it you can find that it naturally melts in your mouth, leaving an aftertaste which brings you on the Nebrodi because it contains all the main essences and scents of our area. You don’t have to imagine it because you can order them, trying this multisensorial experience. Try the platter of black pig cured meats from the Nebrodi! This typical Sicilian dish can be used as an aperitif or as an appetizer, but it can also be served as a single dish coupled with bread and wine. Do you think I am wrong? I’ll explain you why I am not. The traditional simplicity and taste of our Nebrodi Charcuterie is more then any artifice in your kitchen. And I’ll tell you more: we choose each cut of the animal considering the kind of cured meat to produce. Nebrodi Black Pig Sausage and Nebrodi Black Pig Salami (Fellata) with lean meats and fat ones deriving from shoulder and thigh. The difference from other products is due to the bowel used. We utilise a tight and slim bowel to produce the sausages while we use a big and wide one to produce the salami. 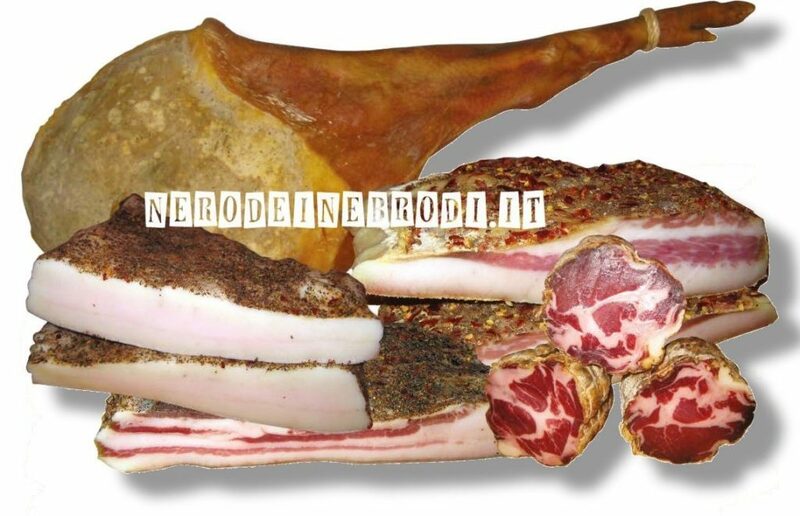 Nebrodi Black Pig Bacon and Nebrodi Black Pig Lard arise form cuts of meat derived from ribs and stomach. These meats are manufactured by hand to obtain a unique and typical deliciousness. Nebrodi Black Pig Cheek derives from cheeks and throat. When this one is produced, according to the culinary tradition of the Nebrodi, it is seasoned hanging from the roof. We realise Nebrodi Black Pig Capocollo using the collar muscle meat.